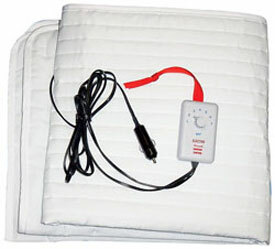 RV Heated Small Mattress Pad Runs On 12 Volts! Heated Mattress Pads to fit RV beds! Runs on 12 Volt Power! Enjoy a great night's sleep anywhere you stop. 12 volt bunk warming pad goes "on the mattress" under you (heat rises). Plugs into the lighter socket. Pre-warms bunk and gets rid of dampness. Heat soothes and relaxes tired back and legs. Helps lull you to sleep. Keeps you warm all night without idling the engine. No more engine noise, vibration, or exhaust fumes. Automatic Comfort Control thermostat regulates heat based upon the setting you select (1 - 7). It adjusts the heat in the bunk for any change in cab temperature. As the cab cools, it supplies just the right amount of extra heat to keep you comfortable. Highly Efficient - the "on the mattress" system with automatic Comfort Control converts 98% of the battery power consumed to heat. Average current usage is about 3 amps. Similar to leaving a few clearance lights on. ElectroWarmth Bunk Warmers do not cause battery or starting problems. An established record in the 12 volt field and well proven in all types of vehicles all over North America and even in Siberia. Ships within 5-10 days plus transit time. The Comfort Control thermostat cycles the warmth on and off at short intervals. It pulls full rated amperage only when cycled on. The amount of time it is cycled on versus off depends on the Comfort Control setting and room temperature. Experience has shown that on the average, it is cycled on less than 50% of the time. Since rated amperage listed is maximum if it is on 100% of the time, the average load on the battery system is 50% or less of rated amperage (reports of battery problems have been negligible over the 30 years we have offered the 12 volt products). RETURN AND CANCELLATION POLICY: Please note that our sheets, comforters and mattress pads, etc. are all custom sewn for you when you order. We do this so we can offer many colors and custom sizes, thousands of combination's, in fact! Because our bedding is custom for your order, please order carefully. Cancellation of an order is generally impossible as we start sewing ASAP. We can only accept returns within 30 days of order, a 50% re-stock fee will apply, and the bedding must be un-opened and in original packaging. Bedding that has been used or washed is not returnable. Please note that you are responsible for all shipping costs. The mattress pad that the heater is built into is not water proof. The heated mattress pad is made of two sheets of fine weave, pre-shrunk poly cotton cloth, quilted together with bonded polyester fill in between. Proudly sewn in the USA.